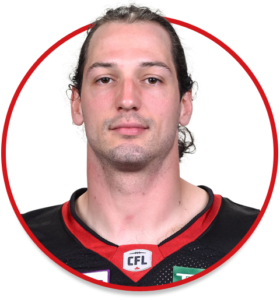 Jean-Christophe Beaulieu is a fullback currently playing with the Ottawa REDBLACKS. Played in 10 regular season games for the Alouettes. He totaled 91 rushing yards on seven carries for one touchdown. Added 50 receiving yards on 6 receptions. The bulk of his offensive stats came from Week 6 against the Winnipeg Blue Bombers (July 27). He had two carries for 42 yards and a touchdown, he ran for his longest run of the year with one of the carries (41 yards). He was drafted by the Montreal Alouettes in the sixth round (49th overall) of the 2014 CFL Draft. In four seasons with Montreal, he carried the ball 11 times for 104 yards with one touchdown, he also caught 23 passes for 202 yards with one touchdown.